Happy New Year everyone! I hope you all had a wonderful time celebrating. We had a quiet one at home, which I enjoy more these days. Now it’s that time of year when we all start evaluating our lifestyles and making some healthy changes (that may or may not be long lasting!) 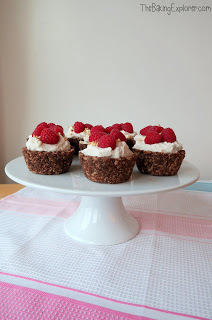 These Raspberry & Coconut Tarts are packed full of goodness, easy to make and taste really good, like really good, so good you might not even believe they are healthy if you hadn’t made them yourself! They’re also vegan friendly, so if you’ve decided to follow Veganuary they are a great recipe to try out. 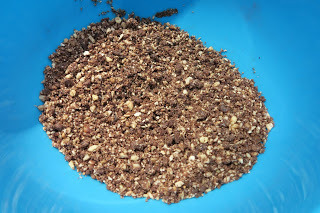 To make the base I put 100g blanched almonds, 90g dried dates, 90g wholegrain crackers, 2 1/2 tbsp cocoa powder and a pinch a salt into a food processor and blitzed it until it resembled fine crumbs. 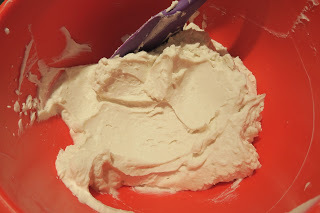 I melted 55g of coconut oil and added it to the ‘crumbs’ along with 6 tsp maple syrup and mixed it all together. 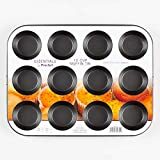 I lined eight holes of a cupcake pan with cling film, then pressed the mixture into the holes making sure the sides and bottom were of an even thickness. Then I put it in the freezer for 30 minutes. To make the filling I took two cans of coconut milk out of the fridge and seperated the thick white topping from the coconut water at the bottom. You can reserve the water and use it for smoothies or curries. Then I whisked it up along with 1 1/2 tsp vanilla extract and 4 tbsp maple syrup (I like it quite sweet but you can add less maple syrup if you wish). 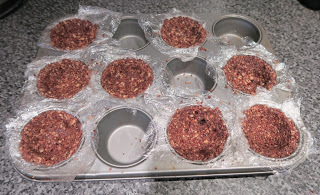 I took the tart cases out of the freezer and took them out of the pan and removed the cling film. 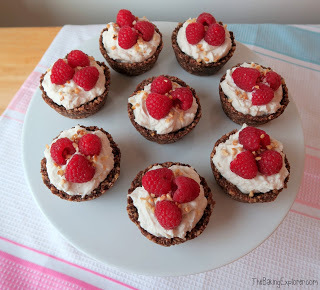 I filled each one generously with the coconut cream, then placed some fresh raspberries on top, and finally sprinkled some chopped roasted hazelnuts on top. And the Raspberry & Coconut Tarts were done! This is the kind of healthy and vegan-friendly food more people need to try as it tastes so decadent and naughty when you eat, but it’s actually good for you. Surely the perfect health food?! The tart base is crunchy and tastes sweet and chocolatey, and the coconut cream melts in the mouth. 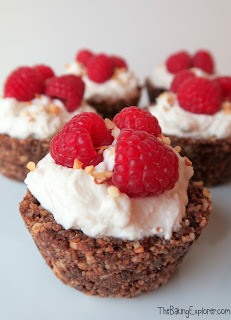 You can add any fresh berries or fruit to these Raspberry & Coconut Tarts depending on your preference, and any nuts too. Recipe adapted from Healthista/Fearne Cotton. I'm pinning & sharing. I hope you are having a great week! Thanks Kimmy! I'll definitely be linking up again in the future! These look so delicious! Love that you made them vegan. I'm always looking for new desserts so I'll have to try these for sure! These sound really delicious! It's good to have something in January that is healthy but makes you think it isn't too! I agree Corina! And these really do the trick! 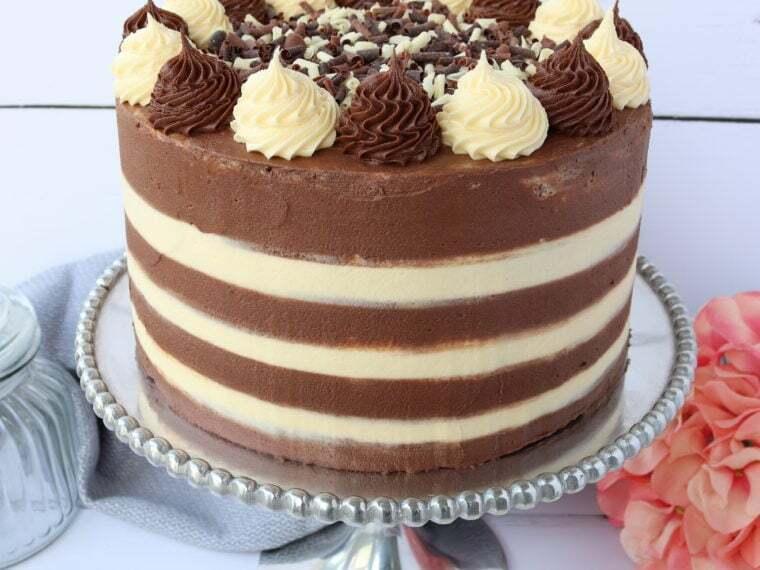 That looks really delicious! A great dessert for Veganuary! Thanks Kate! They are the perfect healthy treat that make you feel sinful! Me too Stuart! Especially when it doesn't taste healthy!